An unmanned rocket carrying a Cygnus cargo ship with nearly 5,000 pounds of supplies and experimental equipment for the International Space Station transformed into a fireball only six seconds after launch at the Wallops Flight Facility in Virginia Tuesday evening. No one was injured in the incident, but there was considerable financial loss. The rocket and spacecraft, which were estimated to cost $200 million combined, were completely destroyed, and there is considerable damage to the launch site. Orbital Sciences Corp., a private company contracted with NASA to carry out the mission, is leading the investigation into what caused the catastrophic failure, according to CNN. 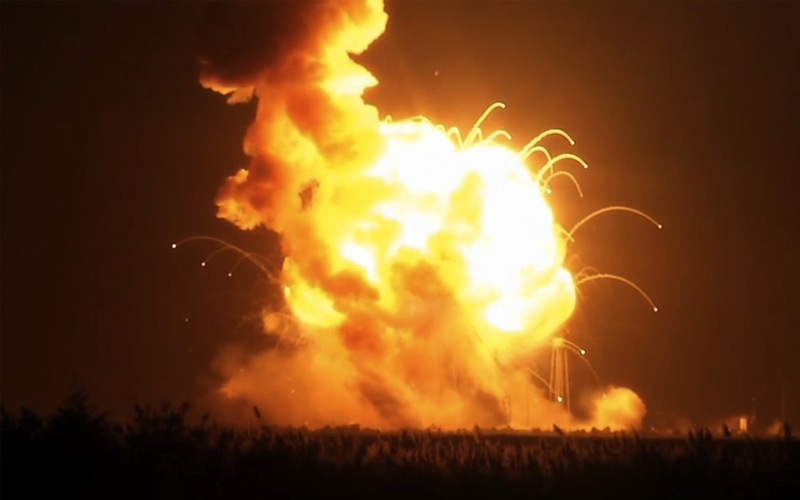 The Antares rocket’s two AJ-26 engines are possible culprits in the explosion. Refurbished and rebranded by Aerojet Rocketdyne, the engines were originally developed as NK-33s by Russia during the Soviet era. One similarly refurbished AJ-26 exploded in a ground test last May, according to Yahoo News. Despite the unfortunate setback, Culbertson was optimistic about the future of Orbital’s program. “Something went wrong, and we will find out what that is. We will determine the root cause, and we will correct that, and we will come back and fly here at Wallops again,” he said. NASA Administrator William Gerstenmaier released a statement noting, “While NASA is disappointed that Orbital Sciences’ third contracted resupply mission to the International Space Station was not successful today, we will continue to move forward toward the next attempt once we fully understand today’s mishap. The crew of the International Space Station is in no danger of running out of food or other critical supplies.